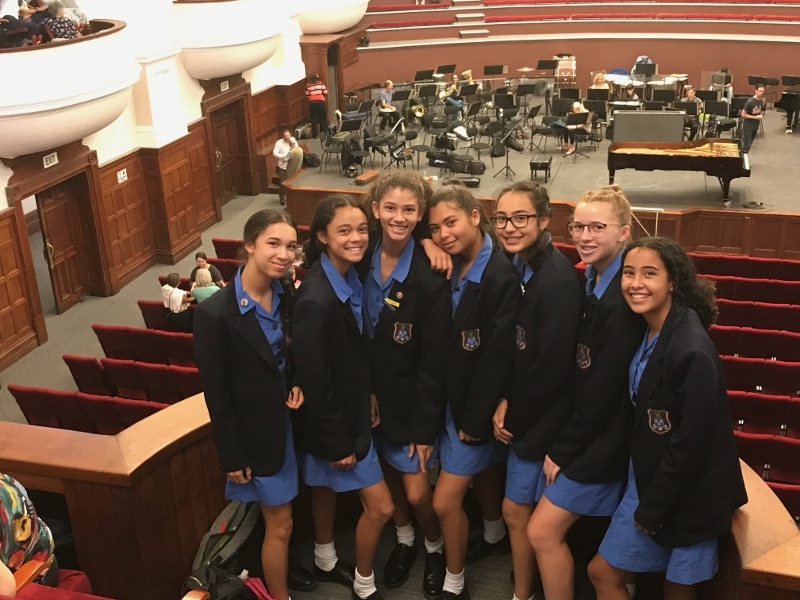 On Thursday 24 January our subject Music students went to the City Hall to watch the Cape Town Philharmonic Orchestra perform works by Jali, Poulenc and Rachmaninov. 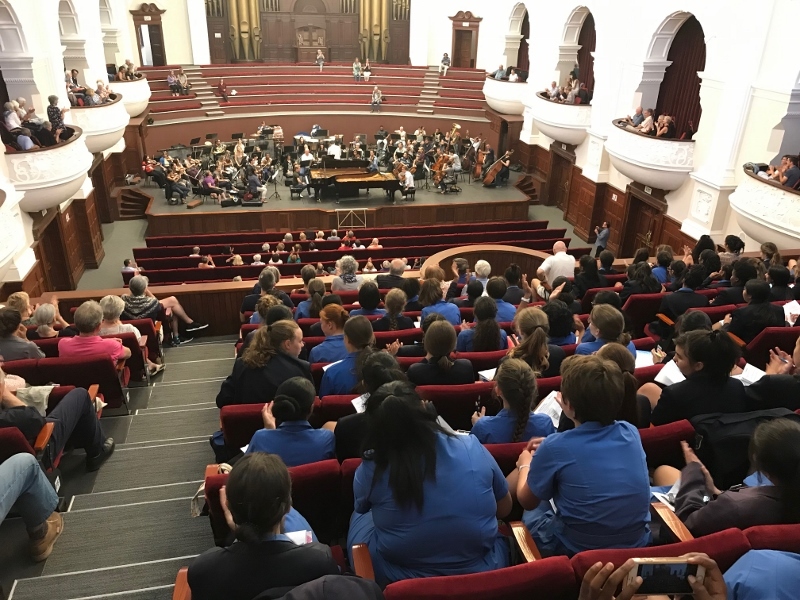 The girls especially enjoyed the Jussen brothers from Holland performing the Poulenc double piano concerto and the hauntingly beautiful melodies of the Rachmaninov symphony. The CPO Outing was amazing, especially the orchestra. They were outstanding and it was very interesting because I have never seen an orchestra live. The City Hall looked extraordinary with all the beautiful chandeliers. I mostly enjoyed the two pianists. They were fantastic and very eye catching! I thought it was so cool that we got to use our iPads for a test. I am so privileged to be using an iPad. Overall, the CPO outing was very entertaining and very enjoyable. It was not my first time but I had not been there since the renovations. The way the pianists combined with the orchestra was beautiful and the pianists were quite eye-catching. It was a great experience and it made it even better with the use of the iPads. The conductor controlled the orchestra and it was amazing how he did not look at his music. It was my first time in City Hall watching an orchestra. The pianists were amazing. It was a very interesting day. The City Hall was beautiful after the renovations. I was very happy that we could use our iPads to do the assignment. I really enjoyed the CPO Outing as the orchestra played amazingly and the pianists were phenomenal. I have never been to the City Hall – it was beautiful. The chairs were very comfortable and the chandeliers were very pretty. I had a clear view of the orchestra and how everyone played. I was amazed by how well the pianists played and how relaxed they were. I was also amazed by how the conductor memorised all the pieces and how he did not look at his music. It was not my first time going to the City Hall but it was my first time listening to an orchestra. The music that flowed through the atmosphere was amazing. The two gentlemen who played the piano were very talented. They made the orchestra stand out even more. They did not need any sheet music to play such a long and fast piece. They memorised everything. The conductor conducted everything very meaningfully. His conducting skill was amazing. It was my first time at the City Hall after the renovations and I was very excited. My favourite part of the outing was when the orchestra, Lucus and Arthur Jussen played the Concerto for 2 pianos by Poulenc because it was amazing to listen to and to watch. It would be so cool to play a duet with your sibling. The conductor was very passionate about his work.